A five reel, three row online slot offering 96% RTP and 25 paylines. 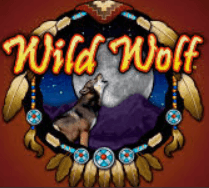 Wolf Gold belongs firmly in the animals and nature genre, and is one of Pragmatic Play’s leading slot games, containing free spins and money re-spins as bonus features, as well as a jackpot contained within the re-spins bonus. UK Slot Games is one of the best sites offering the game, along with over 600 slot games, including ‘Starburst’, ‘Rainbow Riches’, ‘Fluffy Favourites’ and ‘Bonanza’. If you read the title and think this game is all about wolves and nothing else, you’d be wrong. There’s almost a Native American feel to the atmosphere of this game; it takes place against the backdrop of a canyon, with a style of animation that wouldn’t look out of place in ‘The Lion King’ (that’s the original, not the 2018 live action remake). As you might expect from a game that was only released in 2017, it has a dynamic and sleek look that you expect from modern video slots, but it also has a traditional charm to it. This isn’t a game that overloads you with hundreds of complex bonus rounds; it just does what it does well, and offers you plenty of chances to increase your winnings. Ask most regular gamers what they really want, and we suspect they’d tell you exactly that. There aren’t any golden wolves in sight here; that would just be plain weird; but the wolf is not alone in these canyons. As the slightly haunting pan pipe backing music confirms, punctuated as it is by the cries of many a wild animal, there are other creatures out here with the wolves, and your success in the game depends on your ability to find them. Specifically, you’re looking out for a buffalo, an eagle, a horse and a wild cat; they’re a lot more valuable than the standard J, Q, K and A that we’ve all come to expect from traditional offerings. As you’d hope, the wolf is wild, and he’ll substitute for any other symbol to create winning combinations; with the exception of the rock stack scatters, and the all-important money symbols. The graphics aren’t incredible or ground breaking in any way, but they’re pretty enough to look at, and don’t distract you from what you’re doing, which is more important than wowing players with the animation skills of the designers. Not every game needs multiple bonus features in order to be enjoyable, and some even use large numbers of bonuses as a distraction from the fact that there isn’t a fundamentally good game underneath them. Wolf Gold is a fundamentally good game, and so it doesn’t have any such concerns. Therefore it only has two bonus features. 1. Free Spins: Free spins are on offer here, as you’d expect from any slot game made in the past five years. You can trigger free spins mode by landing three of the rock stack scatter symbols, which are impossible to miss because they have ‘scatter’ written on them in bright yellow type. The symbols have to land anywhere on the first, third or fifth reel for the bonus to become active. 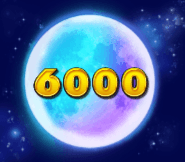 When it is, you’ll receive 5 free spins. If you think that sounds low, take into account that the second, third and fourth reels link up during the free spins feature, resulting in a huge 3 x 3 symbol appearing on the reels every time you spin. If you continue to find scatter symbols during your free spins, the mode can continue indefinitely. 2. Re-spin or Jackpot: Money Re-spin or Jackpot mode basically combines what could have been two separate bonuses into one feature. The money symbols in this game look like bright white moons, with individual values printed on them. If six of them appear on the reels (anywhere, and in any order), every other symbol will disappear, and you’ll be granted three re-spins to find more money symbols to add to the ones you have. Each time a new money symbol turns up, you’ll get another three spins. This process will repeat until you’ve gone three spins without finding any additional money symbols, or every symbol on the reels is take by the moons. It will be your lucky day if that happens; that’s how you win the Mega Jackpot. Failing that, if you do go three spins without any additional joy, you’ll earn a prize relative to your original bet. A quick look at the gaming portfolio of Pragmatic Play, who were founded in 2007, tells you that they’re a design company with a theme; all of their games have a definite visual feel to them, and many of them use the old West as a setting. They have over 100 games on their roster, the highlights of which (other than Wolf Gold, which is probably their most successful title) include Gold Rush, da Vinci’s Treasure, Great Rhino, Madame Destiny and Peking Luck. That feels like they’re selling themselves short; they don’t offer much in the way of description of any of their games on their own websites. Perhaps, like all good designers, they’re of the opinion that actions speak louder than words. The actions that went into the creation of Wolf Gold were definitely positive ones. As Wolf Gold was only released in 2017, it’s yet to spawn anything major in terms of a direct sequel. It’s still in its own honeymoon period as a relatively new game. Things won’t stay that way for long, though. There’s a new release slated for Pragmatic Play in January 2019, and it has the name ‘Mustang Gold’. Although we can’t say for sure until the game is fully released, it looks to take the premise and functionality of Wolf Gold, keep the prairie and canyon setting, and use cowboys and horses in place of some of the more natural settings. That makes it a sequel of sorts, in a time after the cowboys beat the Indians! There is another game in the Wolf Gold family, though. Wolf Gold Scratchcard: All the symbols of the Wolf Gold game are taken, along with the soundtrack, and placed into a standard scratchcard game. There are no bonus features on offer here other than a ‘free play’ symbol which will add another card to however many you’ve originally bought. Pragmatic Play are keen to point out that of the seven scratch card games they currently offer, this one is the top payer. There’s no trick here; just match three symbols to win the value of whatever those matching symbols are. The top prize is a nice, cool one million pounds. The equivalent RTP is somewhere between 67.03% and 74.48%, making it much less likely to offer you a significant win than an online slot. With an absence of other licensed Wolf Gold games to play, we thought we’d take a look at similar titles which have a wolf at the heart of the action. It’s a popular genre, and there are quite a few! These are some of the most popular and highly thought of. As you might have guessed from the name, this slot game from Quickspin takes its inspiration from the popular children’s fairy tale about the three little pigs. They appear on the reels on the game, and rather than trying to find the wolf, you play as the wolf. That’s a neat twist! By far and away the best thing about this game is the ‘Blowing Down The House’ feature; landing three moon symbols enters this bonus round and allows you to do exactly that in order to win prizes. 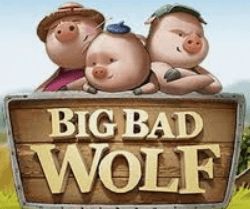 This is a very cartoonish game, with a strong emphasis on fun; it’s not as ‘serious’ as Wolf Gold and doesn’t have the cool, back-to-nature atmosphere that Wolf Gold does so well, but with a very generous RTP of 97.34% it’s a generous online slot that should raise a smile when you play it. You might not immediately think of a connection between the animals you might see on a safari and the animals you’ll see out in the canyons, but that’s sort of the point. Hot Safari is a very similar game to Wolf Gold, with an authentic representation of wild animals on the reel and a strong, natural atmosphere; it just uses the continent of Africa for its animals and scenery instead of North America. It also has the same spirit of simplicity as Wolf Gold; free spins and multipliers are all you can and should expect from the bonus rounds. It isn’t flamboyant, it isn’t flashy, but it’s a solid and engrossing game with an RTP of 96.17%. If you find the process of hunting for wolves in Wolf Gold enjoyable, you might be interested in taking it one step further and hunting them a little more aggressively. In return, the wolves will be a little more aggressive to you; these are werewolves! This is a Gothic, atmospheric game that plants both of its feet firmly in the horror genre. Activating bonuses revolves around finding symbols that contain weapons or traps which you could use to capture a wolf. One of the game’s best features is the werewolf bonus; whenever a werewolf appears on the reels, a fight game will begin between the werewolf and whatever hunters or accessories are on the adjacent reels. Beat the wolf and it becomes wild, thus increasing your chances of a win. Wolf Hunters contains five reels, three rows, and an RTP of 96.3%. If you’re not a fan of horror themed games, though, it’s probably not for you. This is IGT’s take on the wolf genre, and it’s probably the closest game to Wolf Gold out there. In fact, it’s older; this game was released in 2014, so it may have inspired Wolf Gold. The symbolism is certainly the same; we’re in the outback again, and there is Native American imagery on the reels. The Wild Wolf online slot is actually a conversion from an old land-based game, and it shows a little in the design and the bonus rounds, which comprise of stacked wilds and free spins. The graphics are dated by modern standards, too. It’s a solid enough slot game, with an RTP of up to 94.97%, but it definitely shows its age when compared directly to Wolf Gold. You would expect that a game that was not only released within the last couple of years, but released by a company that openly prides itself on designing online slots that are perfectly functional on smartphones, would appear flawless on a smartphone. And of course it does. Nothing of the game is lost at all; the sounds of the prairie, the background graphics and the clear, sharp reels are all here, just as they are on the desktop version. We can’t speak positively enough about the mobile version of Wolf Gold. This is the standard that all developers should aspire to when they’re trying to make their games workable for mobile gamers. It might even be better than playing it on a desktop. Pragmatic Play say that their philosophy is ‘mobile first’ when they’re designing new games. Based on this evidence, they’re right. As a game that’s been on the market for less than two years, and has won awards during that time, you’d expect there to be plenty of positive news within the industry (and even further afield, in the mainstream press) about Wolf Gold. Everybody loves a success story, and when a game does particularly well the developers like to make sure it’s getting its fair share of love and attention from the people who write about slot games. Here are a few places we’ve found Wolf Gold in the press recently. Let’s start with that ‘award winning’ status; it would be rude of us to tell you that the game has won awards and then not tell you what it’s actually won! Calvin Ayre, which is a gambling news website, reported in November 2018 that Wolf Gold had won “Best Slot Game” at the Malta Gaming Awards for 2018. When you consider how many slot games there are in the world (we have over 600 here at ukslotgames.com for a start), winning the outright prize for being the very best is a considerable achievement. As if that weren’t enough, the game’s developer Pragmatic Play also won ‘Innovation in Slot Provision’ for 2018 at a different awards ceremony, as confirmed in the article! When you have a top ranked game developed by a top ranked developer, it’s easy to see why the gaming world is so keen to play it. In further good news for Pragmatic Play, CasinoBeats is reporting that the developer was recently granted a license to supply games in Gibraltar, which marks a further expansion into Europe for a company that already has licenses to operate in the UK, Spain, Italy ad Portugal. The article makes note of how successful Wolf Gold has been for the company. Maybe it was that success that prompted the authorities in Gibraltar to act? They saw how much fun everybody else was having and decided it was wrong for their own people to be left out! Why Is UK Slot Games The Best Place To Play Wolf Gold? As we come towards the end of this article, we’re hoping that the wolf is now howling in your ears and demanding that you give Wolf Gold a try. That goes for existing players as well as those who’ve never played it before! It’s been winning awards for the last year for a very good reason, and we hope we’ve conveyed the excitement and pleasure of playing the game to you in what we’ve covered so far. As we noted in the article, Wolf Gold is one of the most popular games in the world. That means that every online casino worth its salt offers the game to its players. We at ukslotgames.com are most definitely worth our salt, but we offer a lot more than just the basics to you. We believe we’re the best place for you to play not only Wolf Gold, but any online slot title you could ever want to play. Why? Let us tell you! Let’s talk about that gaming library to begin with. We have over 600 popular slot games available for you play, and we stand by them as a selection based on quality and fun. Most websites can’t offer you that kind of variety or range. If you’re bored of playing your usual slot game, there’s always a new one for you to find on UK Slot Games. Secondly, we don’t force you to deposit money when you first sign up. Everybody is welcome to make an account, and you can then browse our entire catalog to find a game you really want to play before you hand over any money. Wolf Gold is a fine place to start, but there’s no reason to stop there! In fact, we do the opposite of forcing you to hand over money. When you sign up, you could win up to 500 free spins on our games just for doing so!